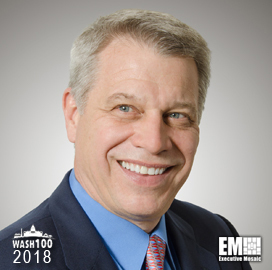 Executive Mosaic is honored to introduce Mark Gerencser, chairman of the board of visitors of the University of Maryland University College, as an inductee into the 2018 edition of the Wash100 — Executive Mosaic’s annual selection of influential leaders in the government contracting arena — for his strong history of executive leadership and current role advancing adult education and government contracting interests. This marks his second time receiving the award. As a leader in the non-profit UMUC Ventures, Gerencser helps securing funding meant to keep education accessible for adult students. Among the organization’s initiatives is the Learn First program, which provides hands-on, job-tailored classes for a company’s employees, offering over 90 degrees, specializations and certificates across a range of courses in cyber security, healthcare administration, public safety and business administration, to name a few. Gerencser is a three-decade Booz Allen Hamilton veteran, having served as managing partner of its global commercial business and headed its government business division. He retired from the McLean, Va.-based services contractor in 2013, and went on to help fund several technology start-ups including CyberSpa, Multi-Flex Pipe Systems and Welbeck Security. Alion Science & Technology named Gerencser to its board of directors in 2016 for his experience in the federal technology services sector. A year prior, Gerencser joined Orion Systems Integrators as a board member, as the New Jersey-based information technology services provider has sought to expand its client base and market footprint. He also sits on the board of Sotera Defense Solutions and is a member of Business Executives for National Security. In addition, Gerencser has co-authored the Washington Post best-selling book “Megacommunities“, and has published several articles on technology, public policy and business. Executive Mosaic congratulates Mark Gerencser and the UMUC team for their selection to receive this award.